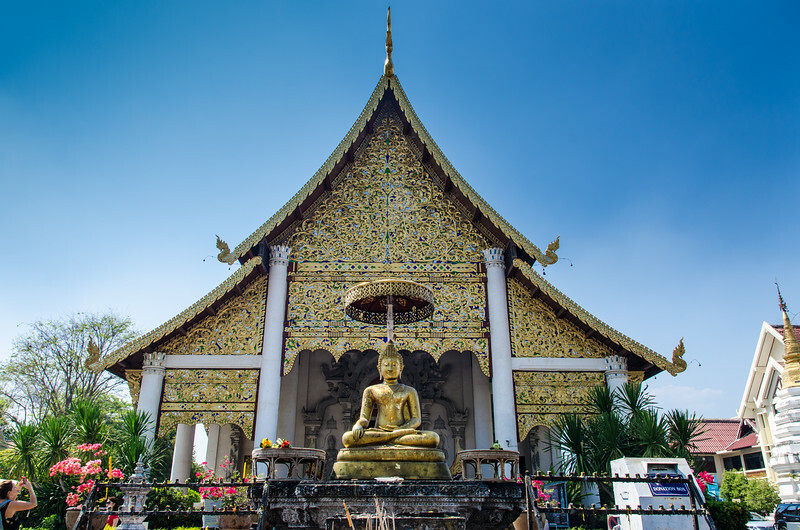 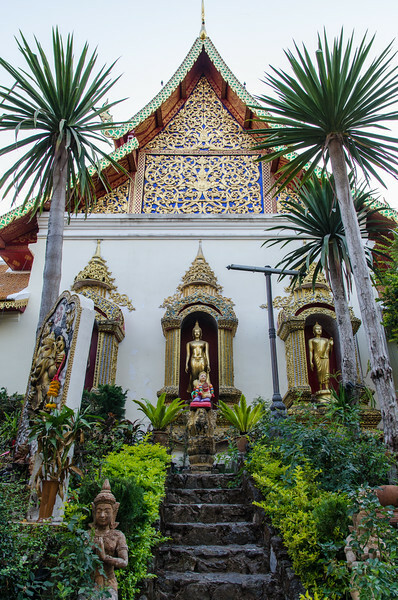 I spent my first full day in Chiang Mai mostly exploring it's many temples and just enjoying the relaxed pace of city life in Chiang Mai. 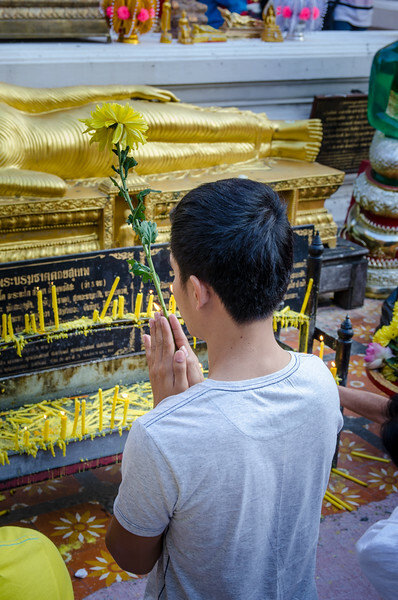 It was quite a change from hectic Bongkok. 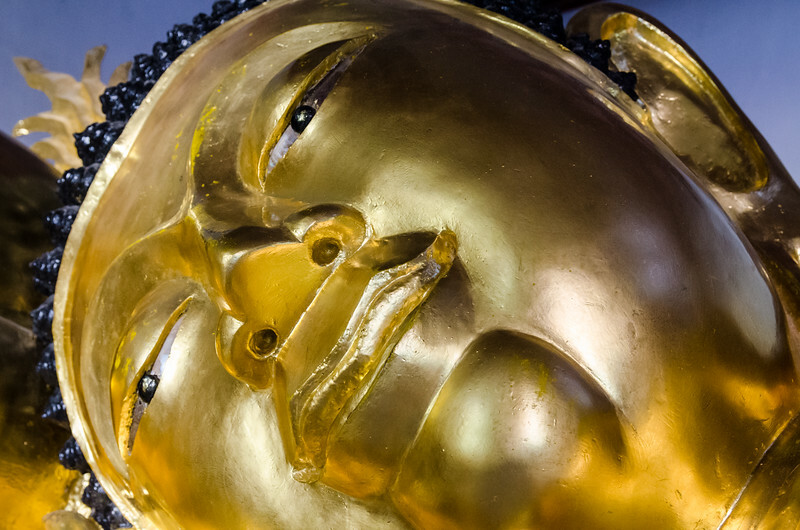 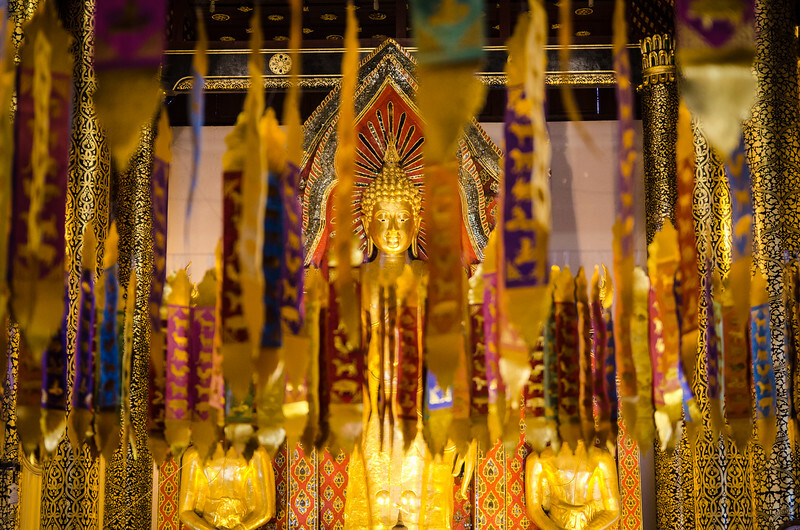 Detail of Virharn Luang at Wat Phra Singh. 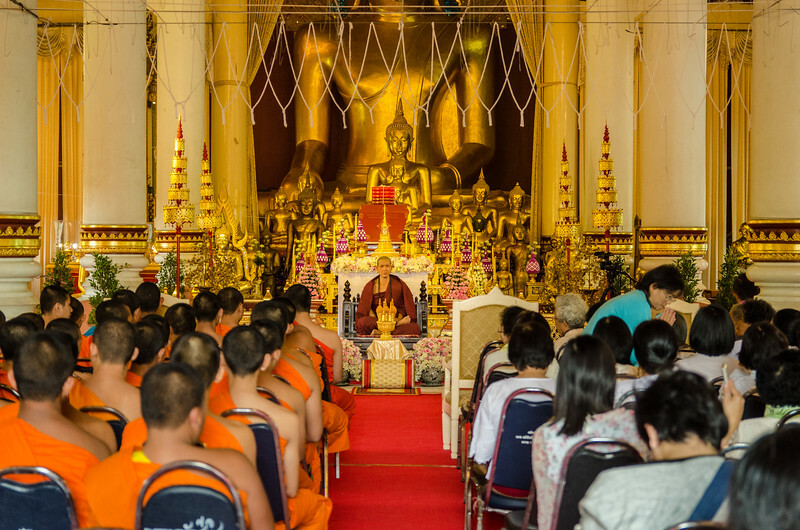 Monks and worshipers inside Virhan Luang. 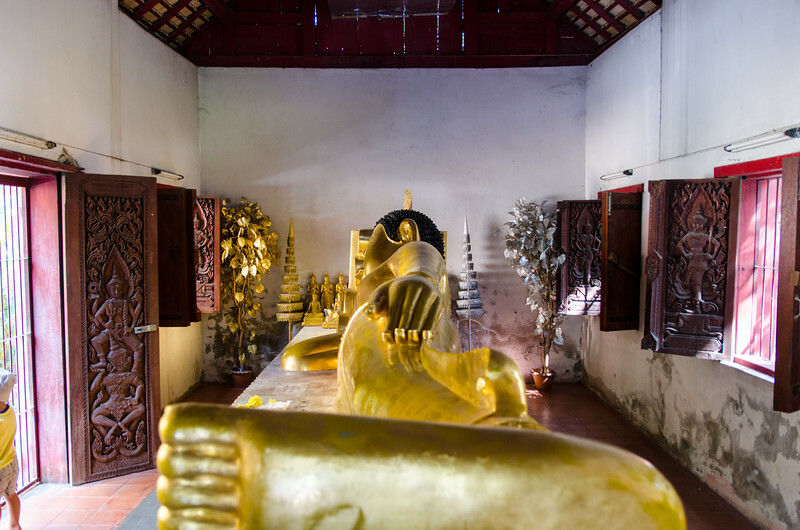 Seated Buddha inside Virhan Lai Kham. 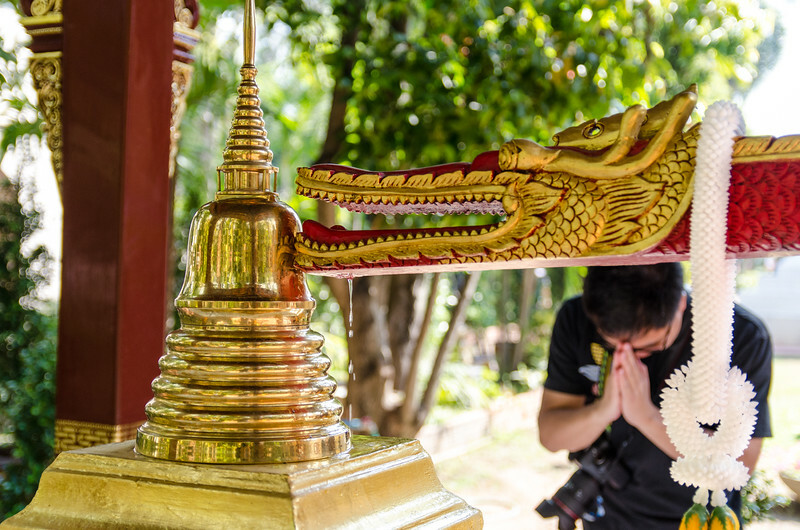 Water offering at Wat Phra Singh. 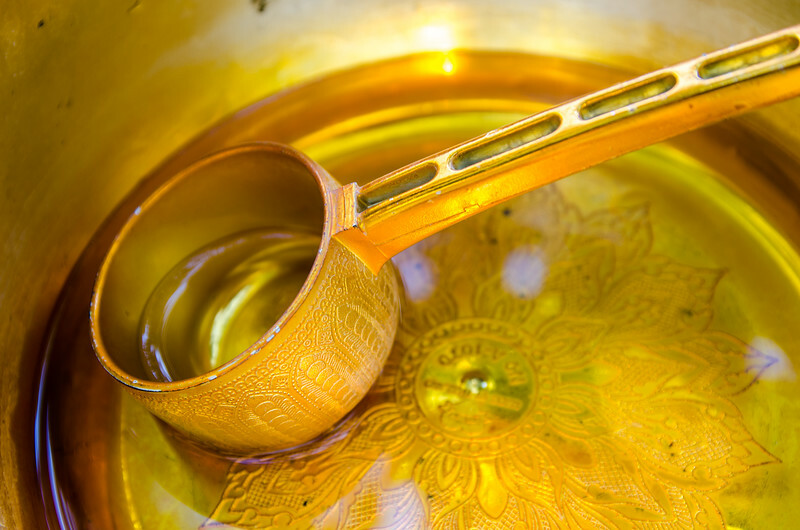 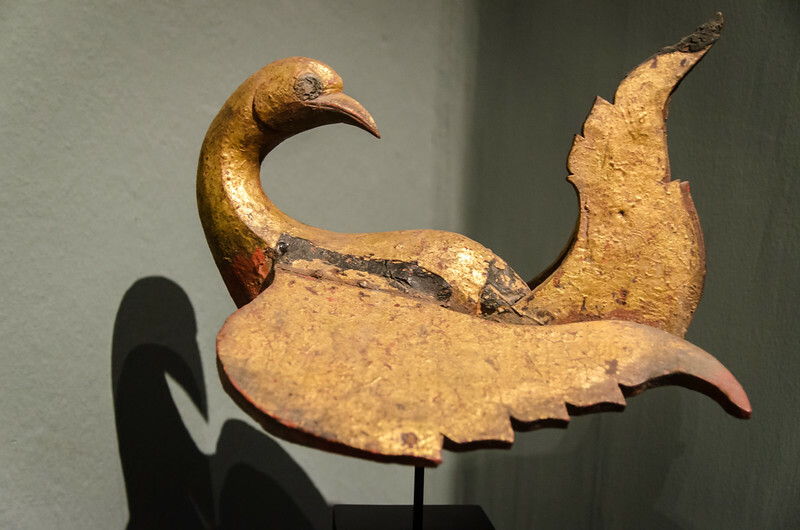 Water offering bowl, Wat Phra Singh. 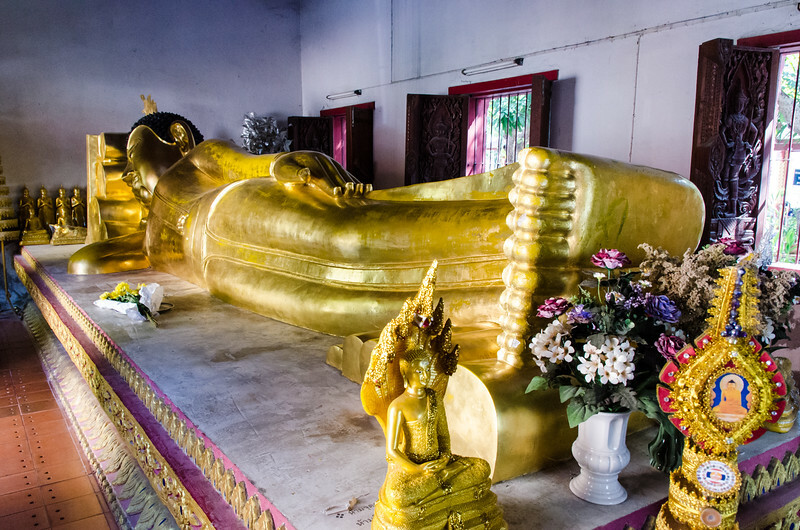 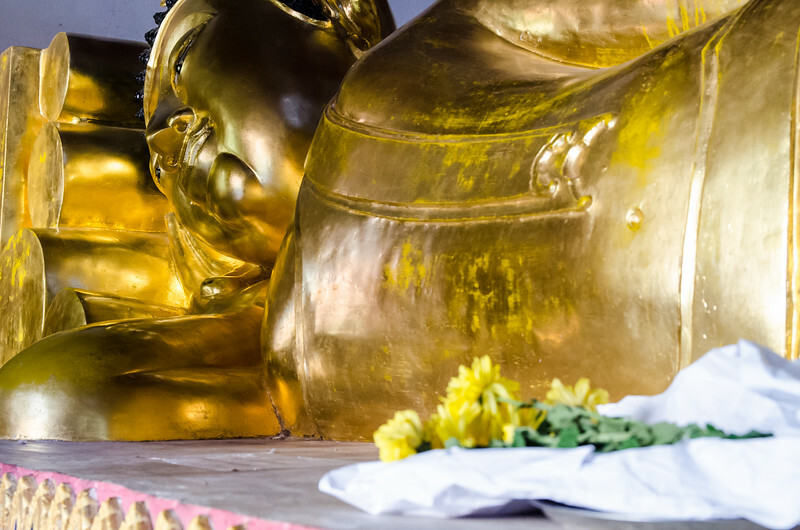 Reclining buddha at Wat Phra Singh. 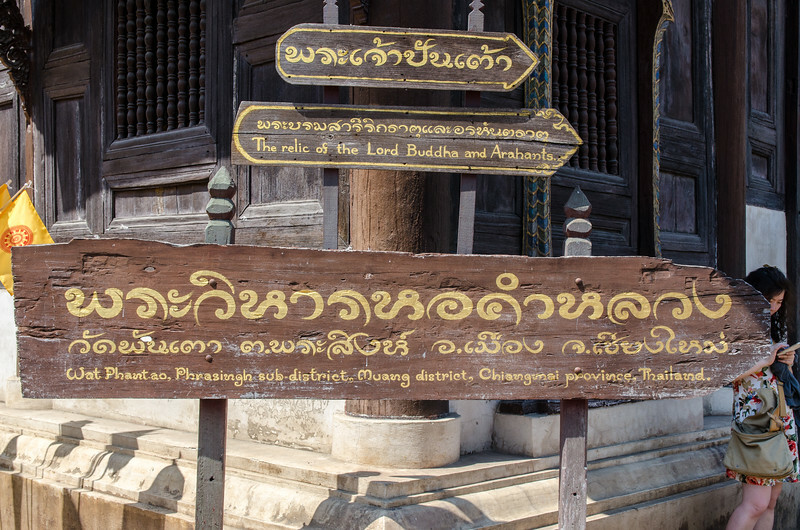 It was interesting to walk around and read the buddhist sayings on the signs. 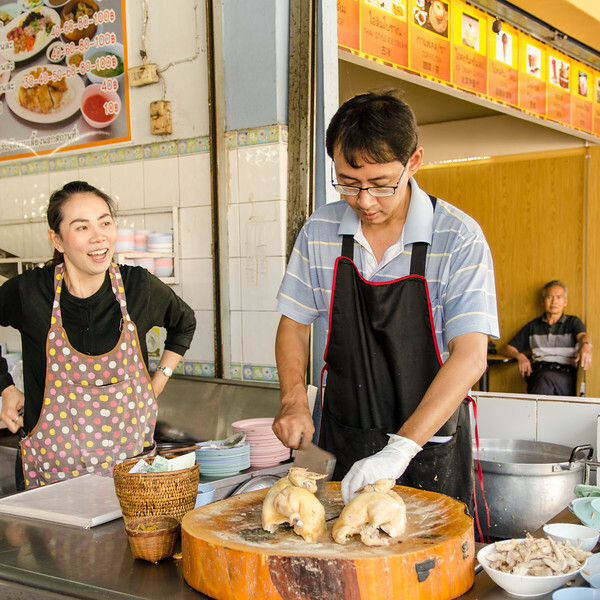 Man cutting up chickens in an open air restaurant in old Chiang Mai. 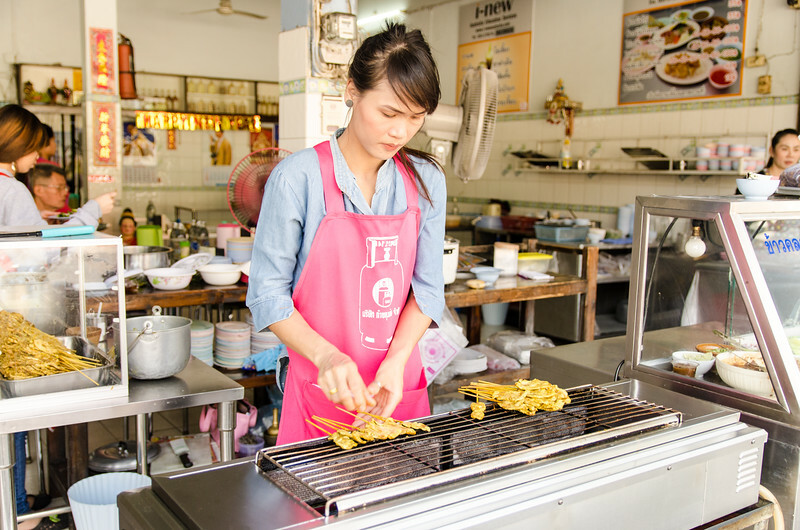 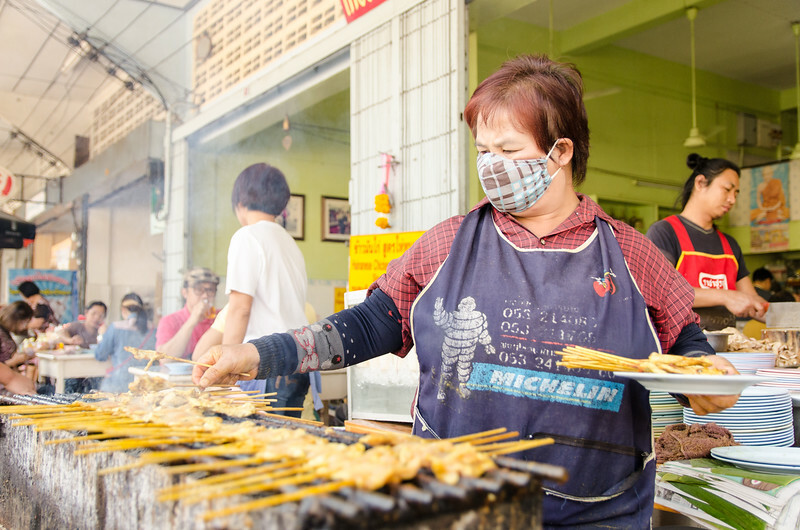 Woman making chicken satay in Chiang Mai. 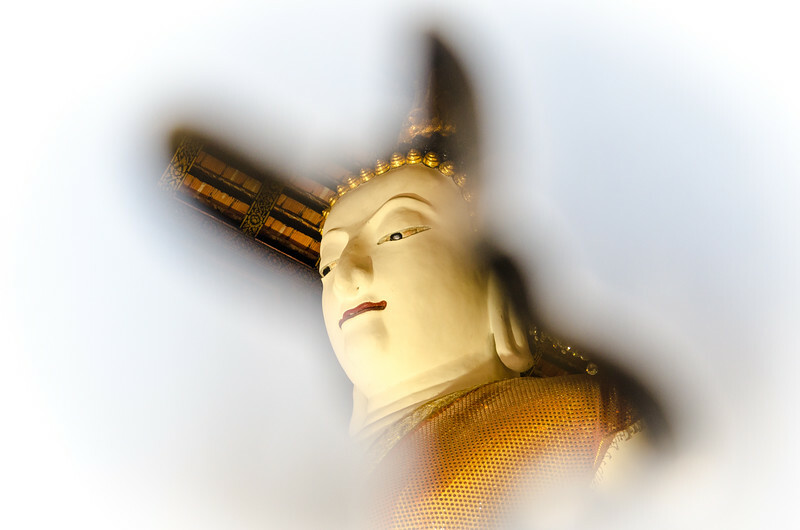 Buddha viewed through an opening in Wat Inthakhin. 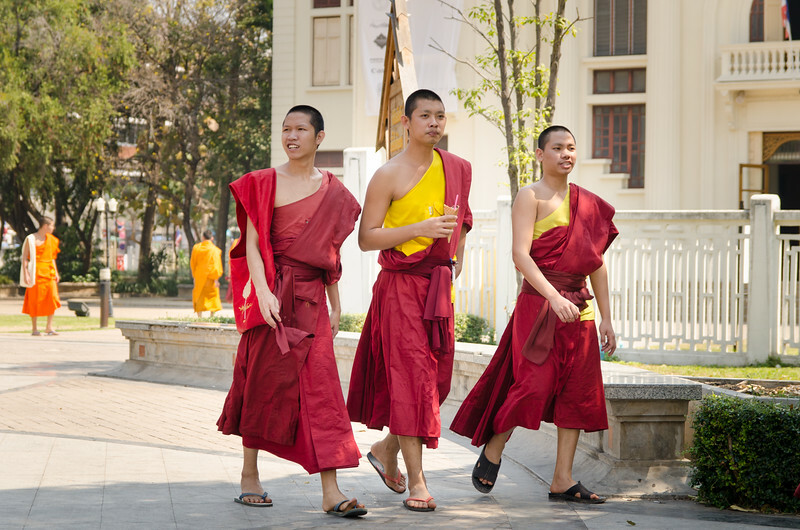 Young monks walk past the Lanna Folklife Museum. 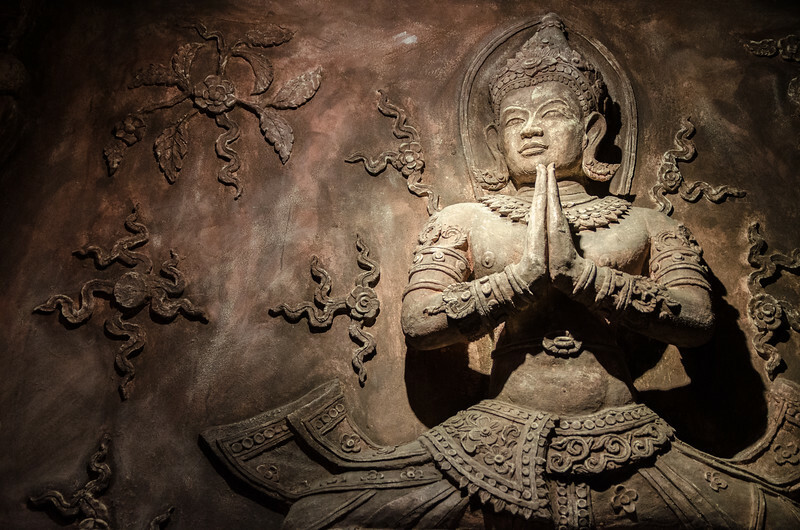 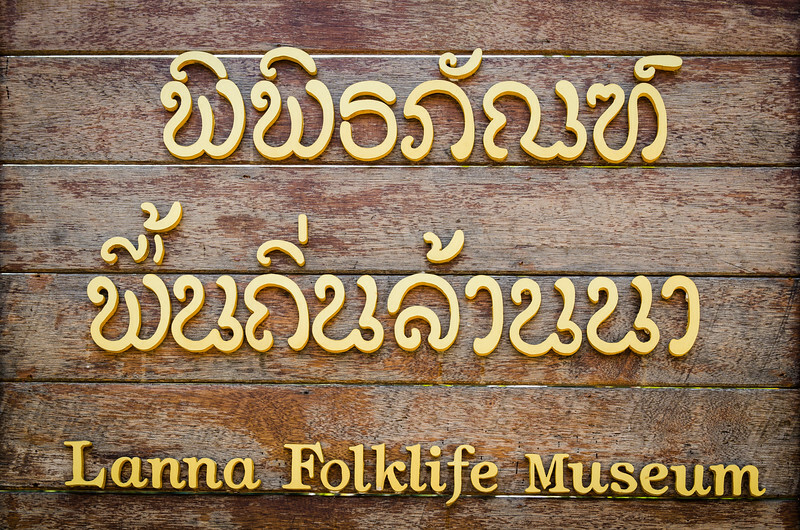 A wooden architectural detail in the Lanna Folklife Museum. 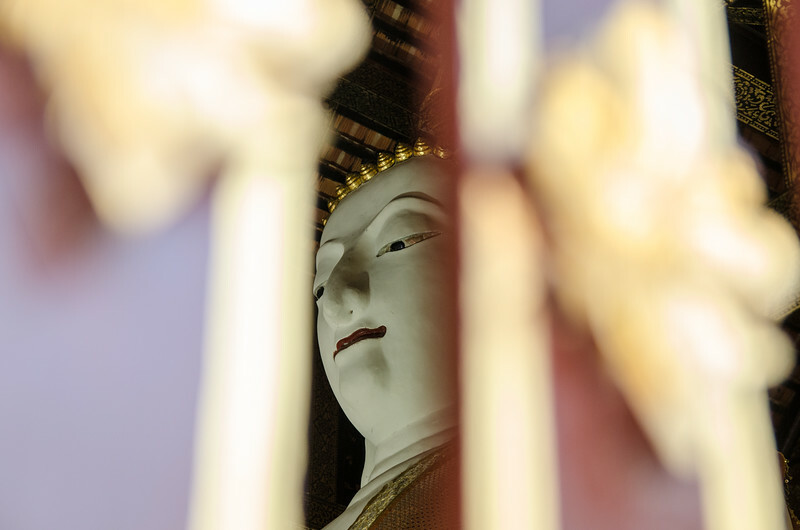 Buddha architectural detail in the Lanna Folklife Musem. 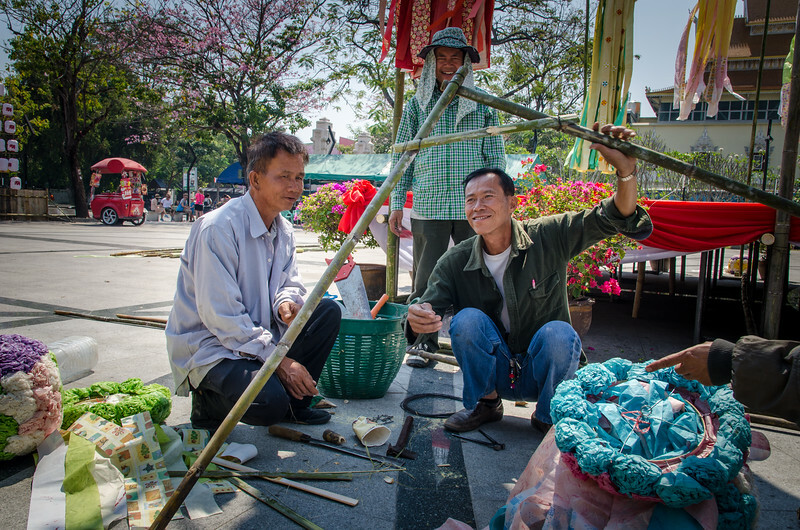 Men setting up decorations in fron of the Three Kings Monument. 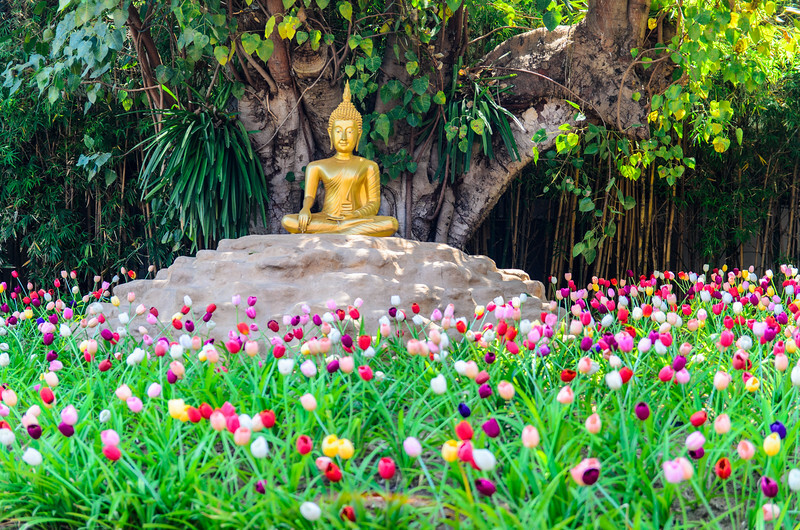 Buddha in a field of tulips at Wat Phan Tao. 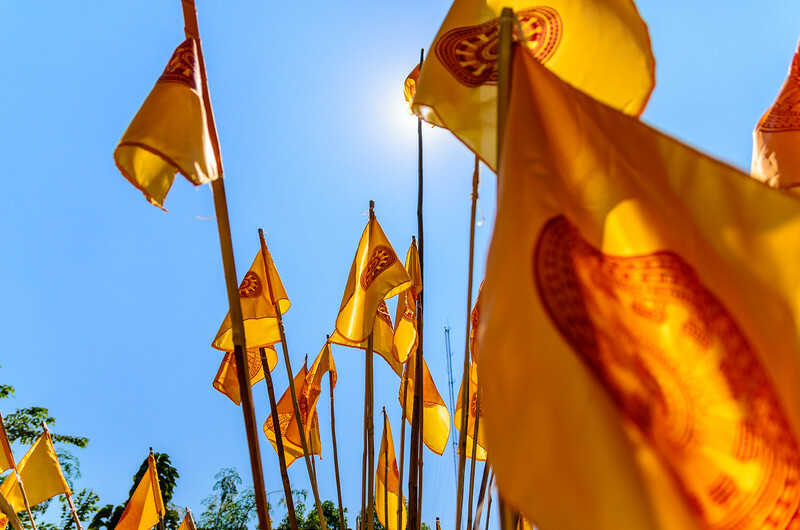 Flags at Wat Phan Tao. 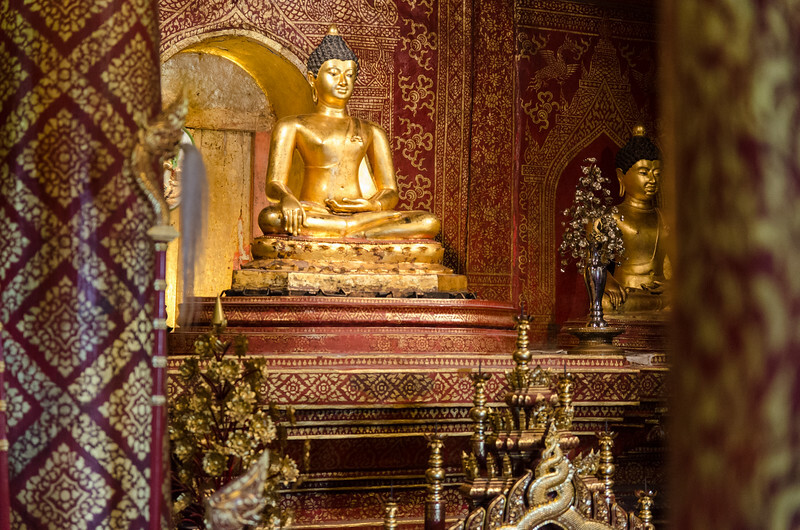 Seated buddha at Wat Pahn Tao. 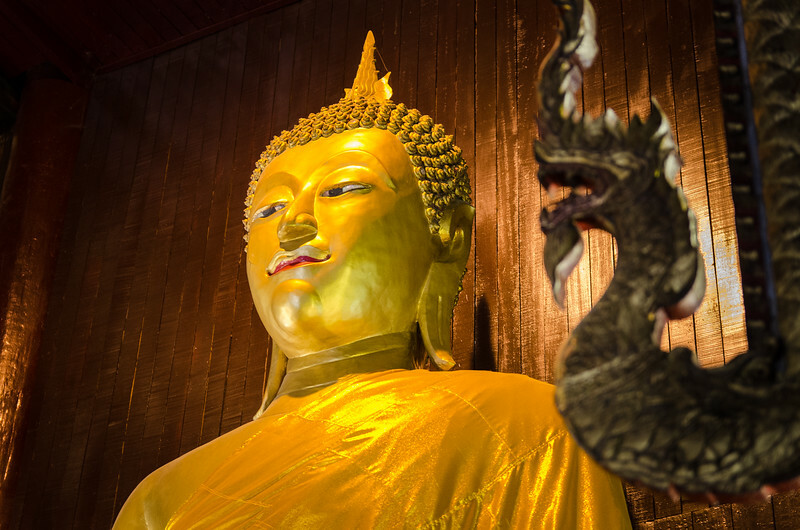 Closeup of seated buddha with dragon in the foreground at Wat Phan Tao. 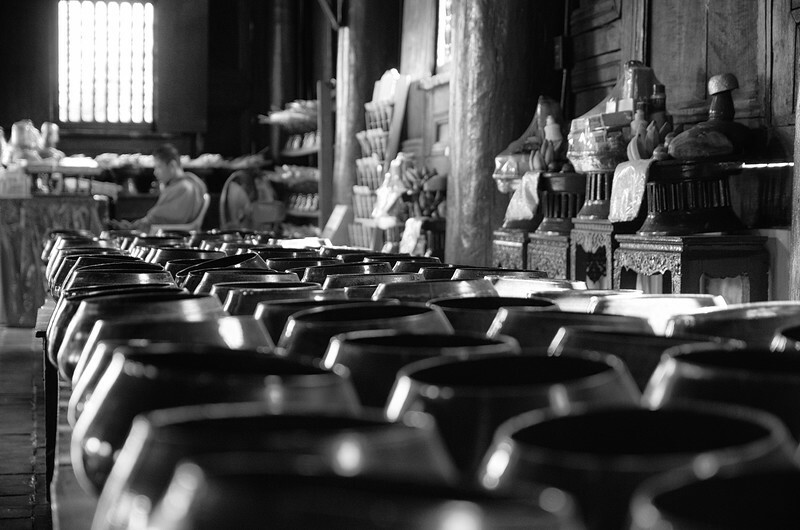 Water offering bowls at Wat Phan Tao. 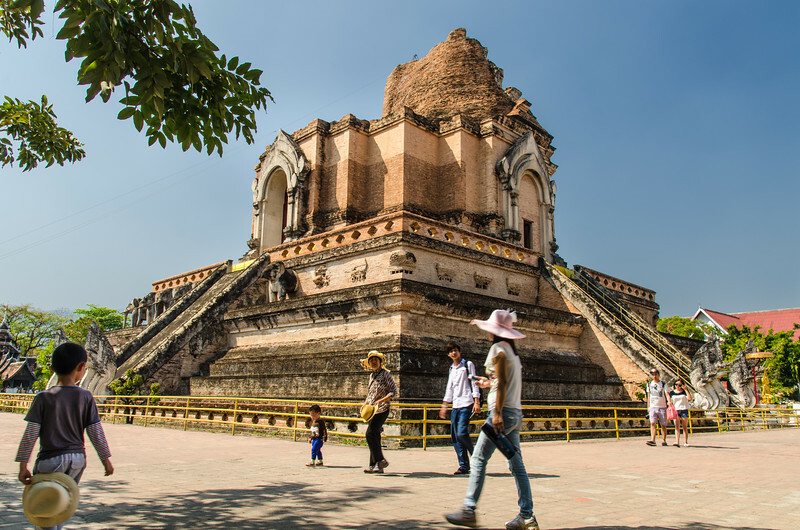 Wat Phan Tao, with resting tuk-tuk driver. 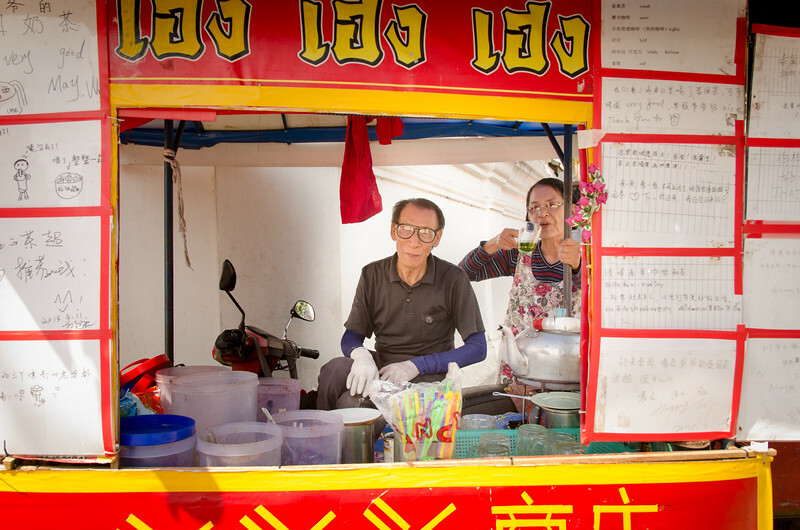 A couple selling food outside of Wat Chedi Luang. 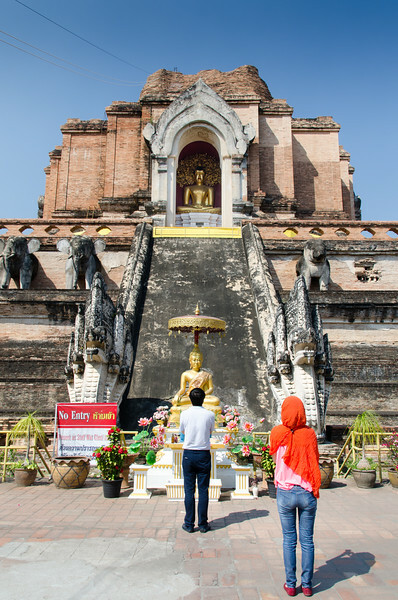 Phra Virhara Luang at Wat Chedi Luang. 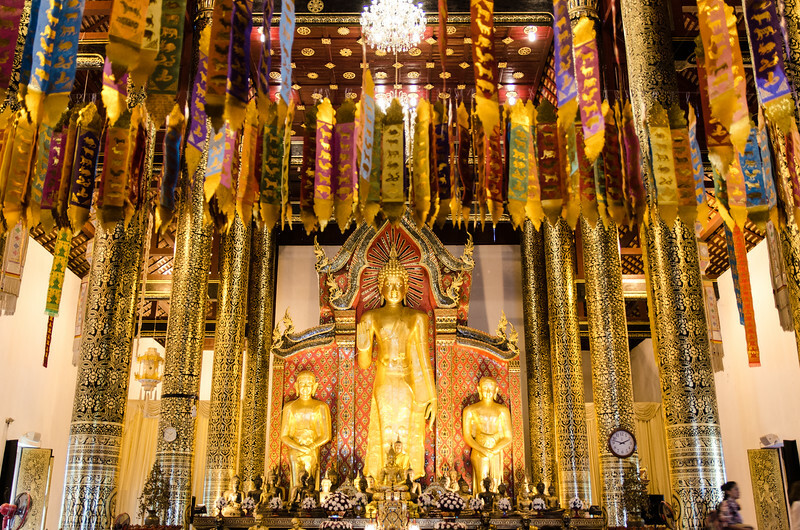 Golden ribbon offerings at Virhara Luang. 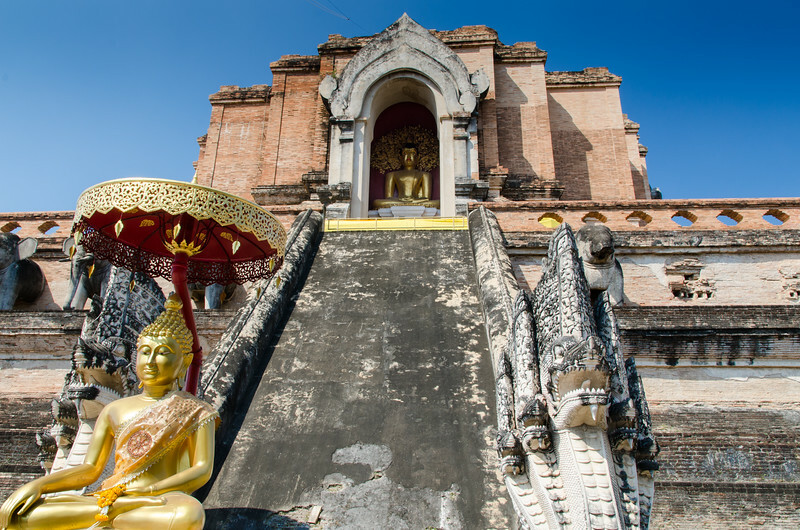 King Saen Muang Ma (r.1385-1401) began construction on Wat Chedi Luang in 1391 to hold the ashes of his father, Ku Na. 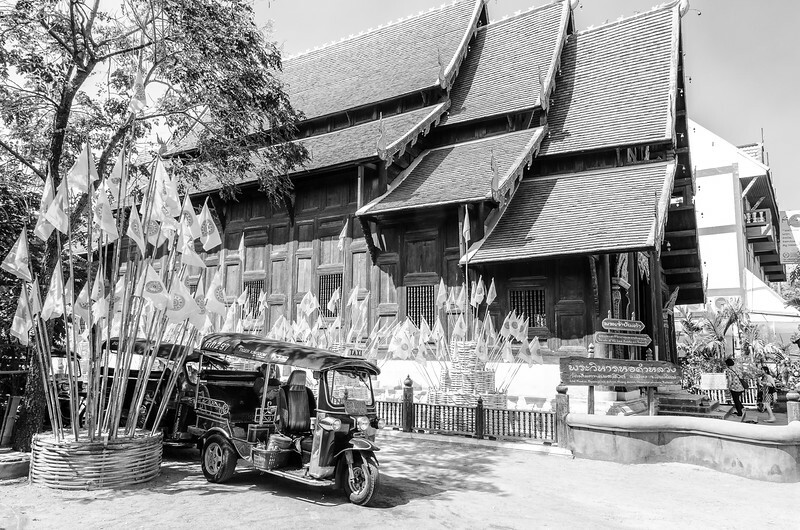 The building was expanded by later kings, reaching its final form in 1475. 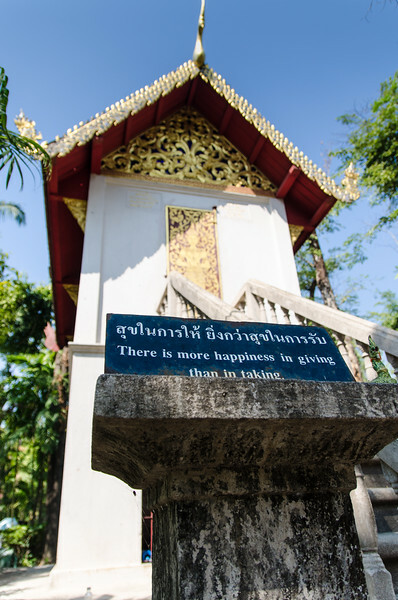 I'm pretty sure it's a rule in Thailand...in front of every beautiful thing you must put an ugly sign. 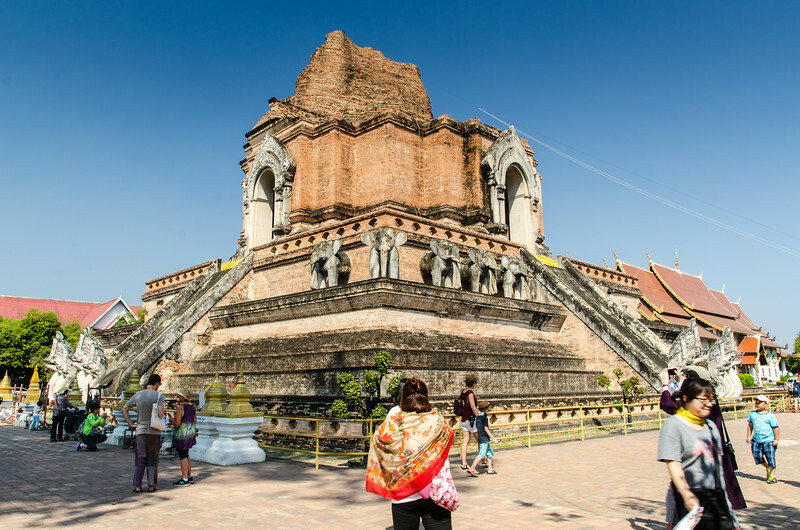 Wat Chedi Luang with buddha and umbrella. 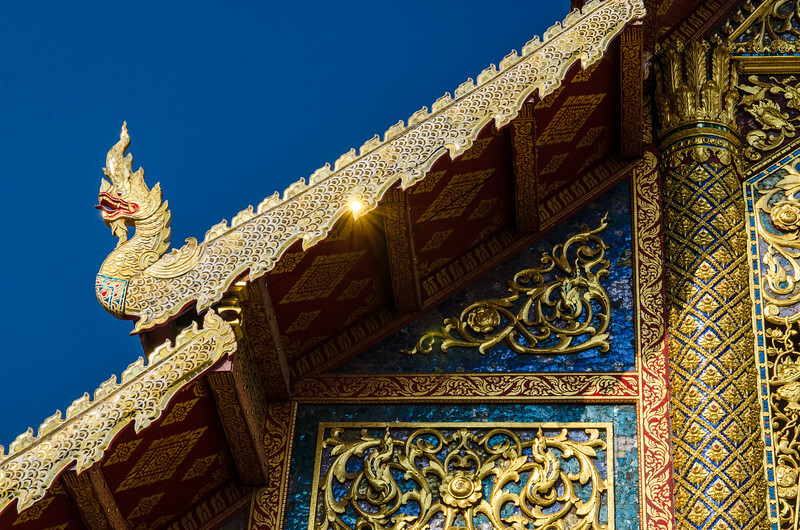 In 1545 an earthquake toppled part of the great spire. 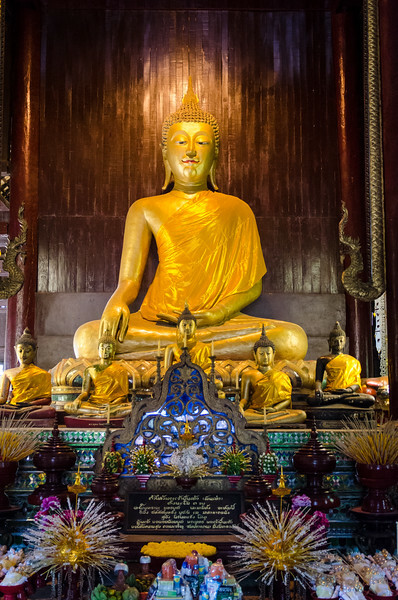 The Emerald Buddha was kept in the chedi for another six years, then moved to Luang Prabang (in present-day Laos) by the king. 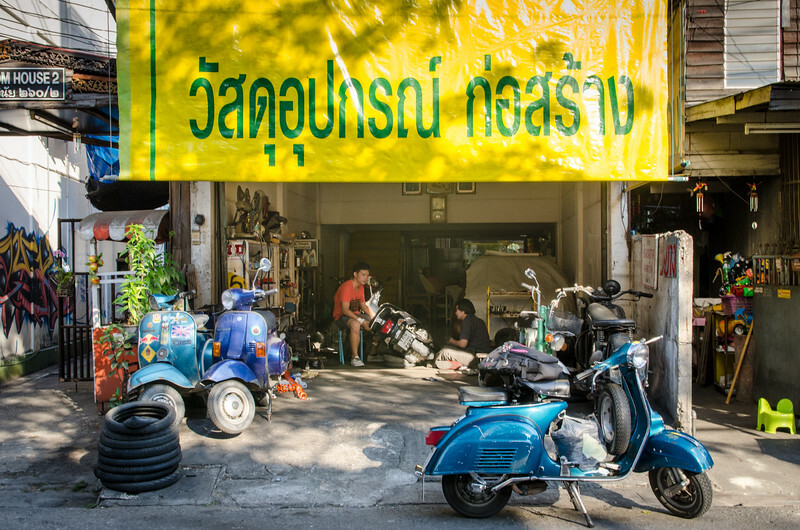 A scotter repair shop in old town Chaing Mai. 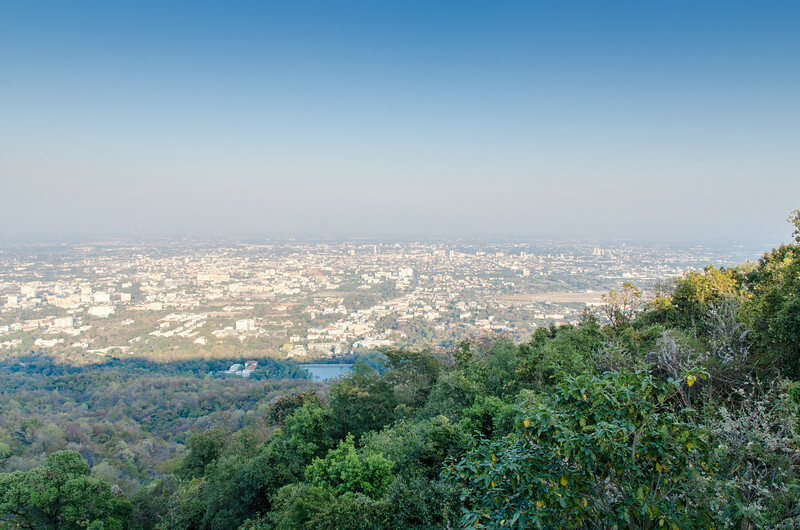 Looking east toward Chaing Mai from a viewpoint half up Doi Suthep. 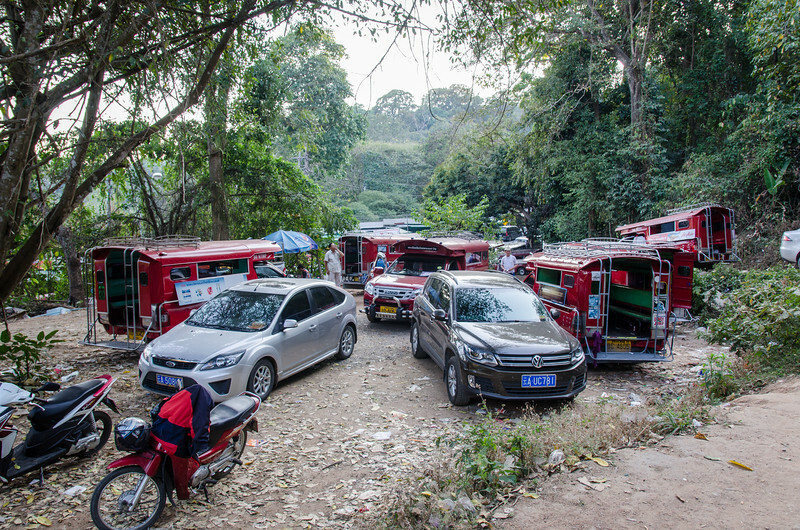 Songthaews (red truck taxis) waiting at Doi Suthep. 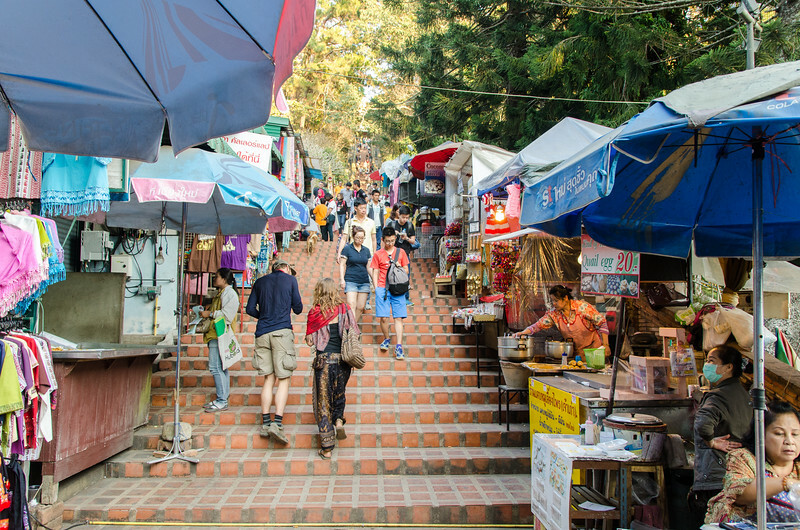 The steps up to Wat Phra Doi Suthep are lined with vendors. 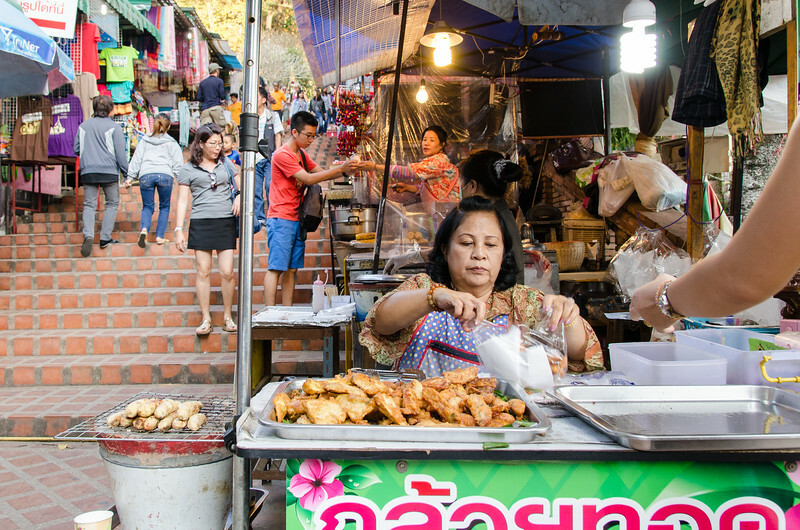 Woman selling food on the step to Wat Phra Doi Suthep. 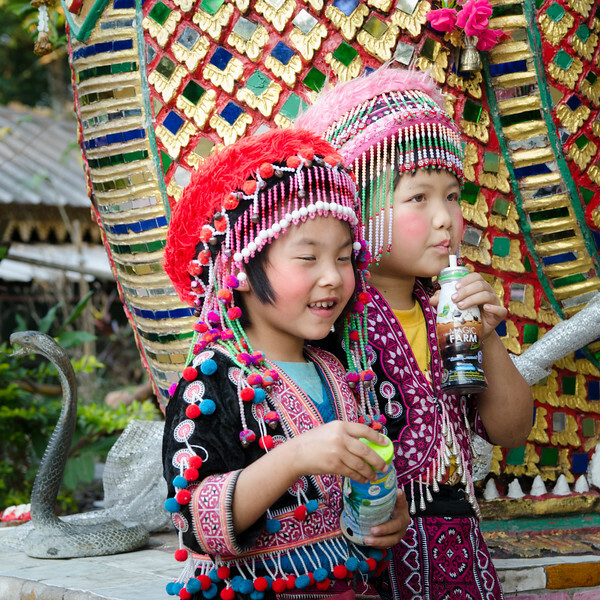 Hmong girls on the steps to Wat Phra Doi Suthep. 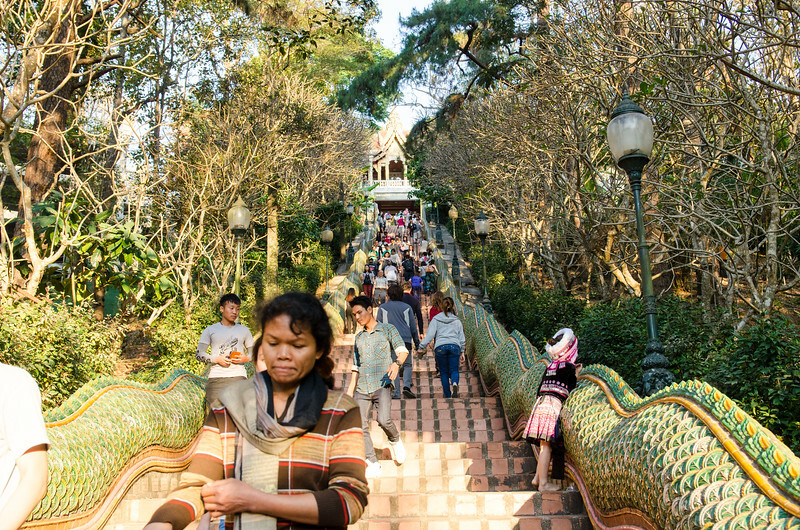 The steps up to Wat Phra Doi Suthep. 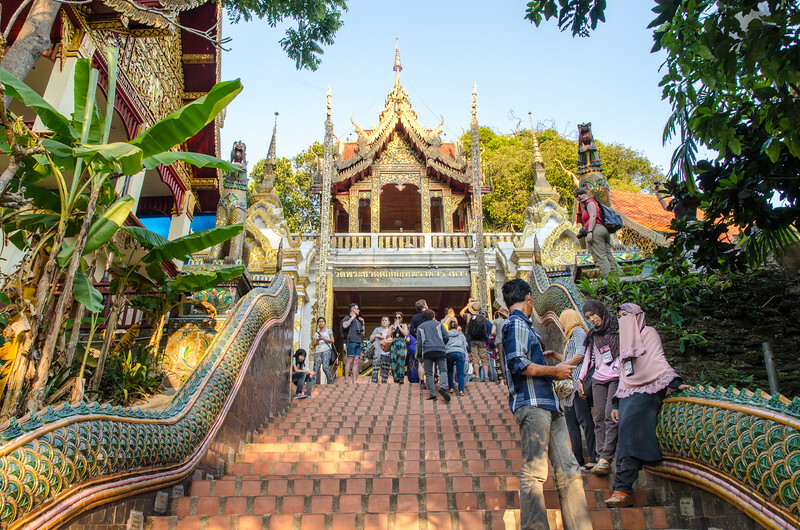 Muslem girls on the steps to Wat Phra Doi Suthep. 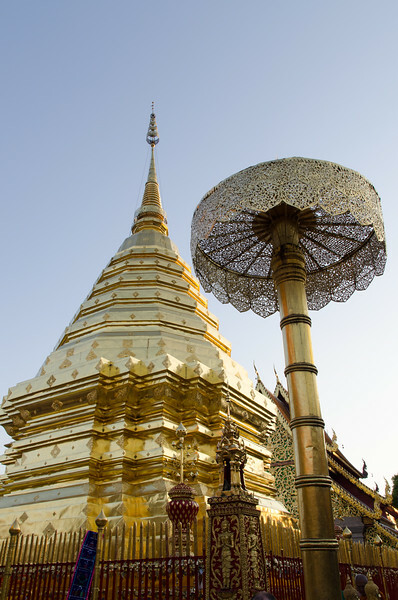 The main pagoda at Doi Suthep with an "umbrella" in the foreground. 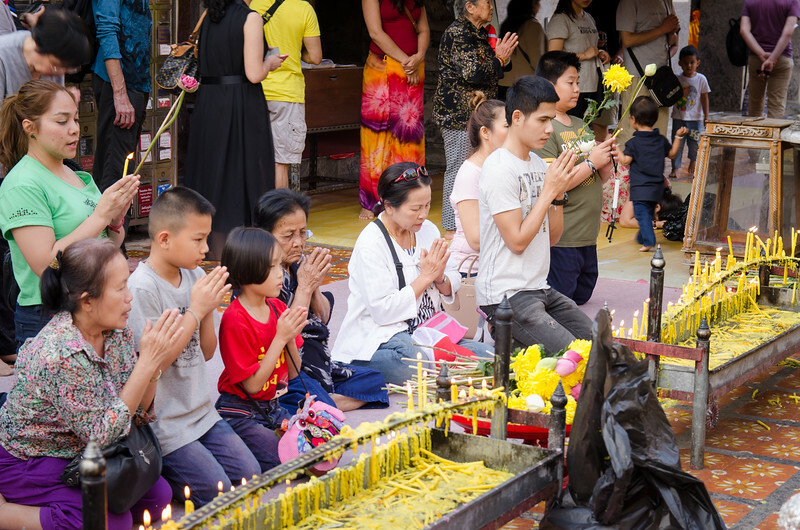 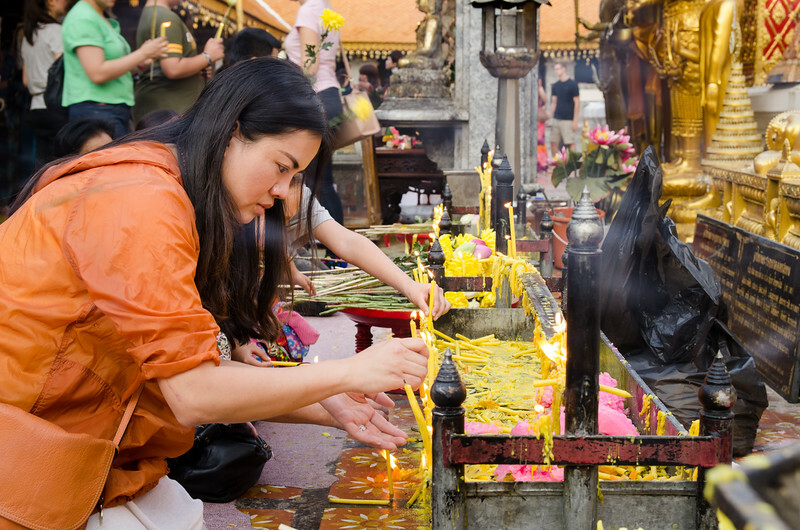 Worsshipers light candles at Doi Suthep.